PrivateFX was founded in 2015. One of the largest investment companies Concorde Capital, which is owned by well-known Ukrainian businessman Igor Mazepa, supported opening and development of the broker. Some of PrivateFX clients came from bankrupted ForexTrend as the broker developed special program 1+1 that allowed to transfer the remaining funds from ForexTrend accounts to PrivateFX. In addition, the broker offers its clients to trade binary options. All you need to do is to choose an asset, predict the trend – up or down – and select the amount of investment. The operation takes 30 seconds. Profit from the successful transaction is up to 80%. PrivateFX clients can trade currency pairs, shares, metals, commodities, CFDs and binary options on the MetaTrader4 platform. Trading account is developed for professional forex traders. The broker provides an opportunity to open an unlimited number of trading accounts if a trader do not have any other similar accounts with zero balance. PAMM account contains all the main offers of a standard trading account, but also a trader can manage several accounts using own capital and investors’ funds. So, both investors and traders receive additional income. All other conditions are identical to the standard trading account. Active investor is a service developed by PrivateFX. It contains all the functions of the PAMM account, but the holder of the Active investor account can also receive trading signals from other PAMM managers. All other conditions are the same as for the PAMM account. 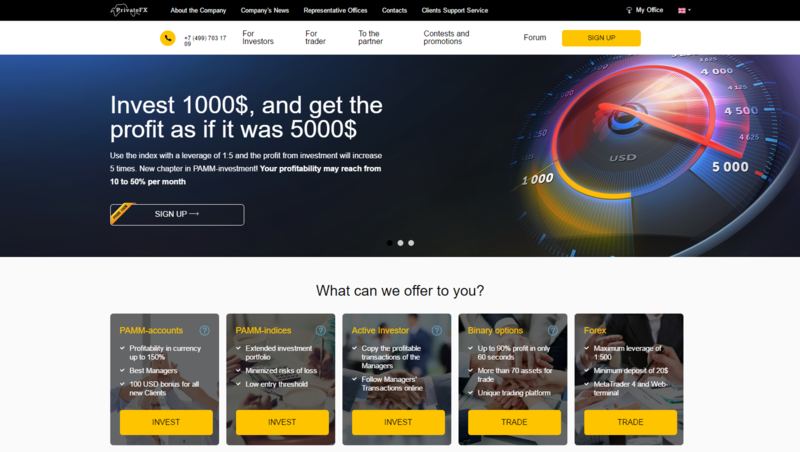 If you have already worked with PrivateFX, leave your feedback about the broker. My advice to all forex traders is to stay away from PrivateFX broker because they are not reliable broker. There was some noise due to Brexit news slipped 85 pips on my stop-loss in GBP/USD pair. This lead to an additional $170 loss. Very hard and lots of money made on their side. I was trading with PrivateFx and seen the poor service and slow execution. While I have 55 trades and make $57 profit only by depositing $250 in a standard account. Last week I was opened 2 short buy position on EUR/USD and USD/JPY pair and set S/P and T/P. But suddenly the trade closed with $56.6 dollars loss. When I check the trade history and see that the S/L or T/P didn't work. So I am disappointed with PrivateFX broker. Sorry to say that when I want to complain to their regulator about this issue, I have seen PrivateFX aren't regulated, also IFSC issued a warning against them. PrivateFx is a 3rd class l broker I see ever in the market. They haven't any Bonuses or Promotions, Also the Multi-step Confirmation Process are disgusting. I was trading in a standard account and getting $200 more losses due to their platform bad service. As last week I had opened 2 buy position on EUR/USD and USD/JPY pair and set S/P and T/P. But the trade was closed with the loss $46.7 and $38.8 dollars. When I check the trade history and I were surprised to see their activity. In both trades, S/P didn't hit the position where I had been set. So I have asked about this matter to their support team, but they didn't respond anymore. It's bad luck to me that the service is too bad. Now I am disappointed with PrivateFX broker. Sorry to say that when I want to complain to their regulator about this issue, I have seen PrivateFX aren't regulated, also IFSC issued a warning against them. from my point of view trading with privatefx for 10 months, I can say this broker are not reliable broker in term of transaction process for deposit and withdrawal. Along my journey with them, average time needed for deposit is 3-6 hours to see money credit into trading account and sometimes, it took 8 hours! For withdrawal process, I have to wait for a days for them to approve my withdrawal and then I have to wait another 4 days for them to transfer my money from trading account to bank account via bank transfer. Trading platform is not working well when during a certain time, it will freeze pop up notification on windows state that application has stop working! In order to overcome this problem I have reinstall again but it never solve the problem. All I can do during trading activity is, I made a stop loss and take profit orders so that if the platform stop working, at least my position already have been set risk and rewards settings. Spread is floating which sometimes it will widen during news event. It is hard to generate with their platform which I manage to gain profit after 5 month trading and it only for 200 USD only from 50 USD as initial deposit. For all traders out there, PrivateFx cannot be labelled as reliable broker. I chose to close my trading account with them because the prize that I won from one of their trading contests , the Contest For Traders was not credited to my account. I was ranked in 3rd place and supposedly get 500 USD but no money has been credited in my account. The thing that was really upset me was I funded my account worth 400 USD just to participate in the said contest. The contest administrator told me that my trading account is not qualified to receive the prize. What?! I met the requirements of the contest and I even got a chance to participate, and when I won, they suddenly told me that I was not qualified! Such a lame excuse! They're fabricating lies just to prevent me to taking the contest prize! Another thing is they even reduced my deposits when I requested to withdraw all my funds and close my account. So guys, please beware. Think twice before making any decisions. I swear, this company not good! Do not believe about the positive reviews about them, for sure, they're not from the real Forex traders! privatefx become my ex-broker because of their service that are so slow make me decided to leave them. I only try their system for a month only and I found that I can’t generate profit from their platform. Execution was slow, spread increase during normal hour which mean no economic event for that pairs. Sometimes the platform will freeze especially during economic event that give high impact on markets. Deposit and withdrawal transaction slow to process and it took a weeks to transfer from my bank account into trading account. When I want to withdraw all my fund with them, it took 3 weeks to complete the transaction. I just loss 100 USD and after I make some profit to cover my loss 300 USD and withdraw all my money 400 USD via bank transfer.